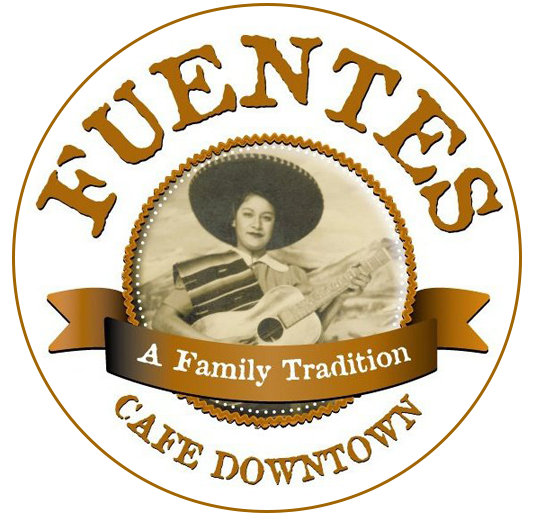 Fuentes Cafe Downtown | Proudly Serving the People of San Angelo for More Than Fifty Years! Mexican Classic: Tow eggs any style, topped with Spanish sauce. Served with fajita potatoes, beans and flour tortillas. Two scrambled eggs filled with beef, topped with Spanish sauce. Served with fajita potatoes, beans and flour tortillas. Two scrambled eggs mixed with tomatoes, onions and hot chilies. Served with beans and fajita potatoes. Two scrambled eggs mixed with tostado chips, our own hot sauce, enchilada sauce and grated cheese. Served with beans, fajita potatoes and flour tortillas. Served with two eggs any style with hot chilies, beans, fajita potatoes and flour tortillas. Spicy Mexican sausage, chopped and grilled with eggs. Served with fajita potatoes, beans and flour tortillas. Ribeye steak served with two eggs, any style. Two scrambled eggs mixed with diced ham and cheese. Served with fajita potatoes and toast. Two eggs served any style with fajita potatoes and toast. Bacon & egg, sausage & egg, ham & egg, chorizo & egg or potato & egg. Plate of corn tortilla chips with beans, taco meat or chicken. Top with your choice of melted cheese, guacamole, onions, tomatoes and jalapenos. Classic Cinco Nachos with beans, beef fajita, chicken fajita, or mixed fajita meat. Classic Cinco Nachos with shrimp. Beef or chicken. Choice of lettuce or cabbage served with guacamole and sour cream sauce. A plate full of our fresh tortilla chips topped with melted cheddar cheese and jalapenos. Choose any toppings or mix them up. Made with avocado, chunks of chicken breast, tortilla strips and Monterey Jack cheese. Your choice of taco meat or seasoned, shredded chicken; served in tortilla taco bowl holding bed of crisp lettuce, tomatoes, avocado slices, cheddar cheese, your favorite dressing. Grilled chicken breast served on bed of romaine lettuce, tomatoes, bacon bits, home-made croutons, Caesar dressing, parmesan cheese. Your choice of chicken or beef atop bed of lettuce, tomatoes, avocado. Bacon-wrapped chicken stuffed with jalapenos and Jack cheese, served in taco shell with lettuce, tomatoes and avocado slices. All taco plates three to an order and served with beans & rice. Crisp corn tacos with your choice of homemade taco meat or shredded chicken. Soft corn tortillas filled with beef or chicken, lettuce and tomatoes. Warm flour tortillas, filled with your choice of ground beef or shredded chicken, topped with lettuce and tomatoes. Tacos Baja style! Each has a strip of fish fillet battered, deep-fried, placed in soft corn tortillas with guacamole, cabbage and pico de gallo. Seven of our most popular dishes, named for members of Fuentes family. Two cheese enchiladas, beans, rice, salad, chili con queso. Taco, cheese enchilada, beans, rice. Taco, two cheese enchiladas, beans, rice. 8 oz. steak topped with Spanish sauce, served with beans, fries or baked potato, flour tortillas. Beef copita and guacamole salad appetizer. Tamale, cheese enchilada, crispy beef taco, beans and rice. 8 oz. grilled pork chop served with borracho beans, rice and a salad. 8 oz. steak topped with Spanish sauce, served with cheese enchilada, guacamole salad, beans, rice, flour tortillas. Burrito dinner your choice of meat and choice of topping served with beans and rice. All of our hamburgers are made from fresh ground beef. Each is served with mustard, lettuce, onions, tomatoes, pickles and a side of French fries. The classic bacon, lettuce & tomato. Ham & cheese on three slices of bread, with mayonnaise, lettuce and tomatoes. A Fuentes original! Boneless, skinless chicken breast cooked to perfection with onions, tomatoes and calavasa (zucchini). Two chicken breasts topped with chili con queso, served with beans, rice, flour tortillas and salad. Chicken breast topped with chili con queso, served with beans, rice, flour tortillas and salad. Two chalupas, one beef, one bean, topped with cheese and guacamole. Two bell peppers filled with ground beef, Spanish sauce, cheese. Served with beans, rice, salad. Two beef tacos and two cheese enchiladas with chili sauce. Mexican pepper filled with beef, fried in an egg, topped with Spanish sauce and cheese. Served with beans, rice, salad. Stew meat simmered in a seasoned sauce, served with beans, rice, flour tortillas, salad. Cheese enchilada, tamale, beans, rice, coleslaw. For BIG appetites - stuffed pepper, taco, cheese, enchilada, tamale, beans, rice, guacamole salad. Taco, cheese enchilada, tamale, beans, rice, guacamole salad. Taco, cheese enchilada, tamale, beans, rice. Three filled corn tortilla cups: one beef, one bean, one guacamole. Three corn tortillas rolled, grilled, served with guacamole, beans, rice, salad. Diced chicken breast grilled with jalapenos, onions and tomatoes. Served with beans, rice, flour tortillas and salad. Two chicken enchiladas topped with Spanish sauce, whole beans, rice and salad. Only 5 grams of fat! Three enchiladas, beans, rice, choice of coleslaw or salad. Choose from beef, chicken, guacamole or spinach. Three rancheras-style enchiladas stacked with beans, rice, choice of coleslaw or salad. Your choice of meat filled in flour tortilla. Beef or chicken in a warm flour tortilla. Plump shrimp with bell peppers and onions in a warm flour tortilla. Served with French fries or baked potato. Tasty morsels from the most tender cuts of beef are seasoned with our own dry rub and grilled with jalapenos, onion and tomatoes. Served with enchilada, beans, rice, guacamole and flour tortillas. Tasty morsels from the most tender cut of beef are seasoned with our own dry rub and grilled just to your liking. Served with French fries or baked potato, salad. A 6 oz. beef cutlet dipped in our special breading, covered with our homemade cream gravy. Served with French fries or baked potato, salad. A tender, juicy 8 oz. steak served with French fries or baked potato, salad. Diced steak grilled with jalapenos, onions and tomatoes. Served with an enchilada, beans, rice, guacamole, flour tortillas. Six pieces of fresh breaded beef cutlet. Served with French fries and salad. Fresh ground beef packed tightly, then cooked with sliced onions and topped with brown gravy. Served with French fries or baked potato, salad. Served with onions, bell peppers, guacamole salad, flour tortillas, beans, rice. Any fajita plate can be served a la Mexicana style with jalapenos, onion and tomatoes $1.50 extra. Monterey Jack and the ingredient of your choice heated until hot and melted on a flour tortilla. We add fresh pico de gallo, sour cream and a scoop of guacamole for a classic Tex-Mex favorite. Two boneless, skinless chicken breasts breaded, served with cream gravy, French fries or baked potato, salad. Six pieces of tender chicken breasts breaded in our kitchen, served with cream gravy, French fries, salad. 6 oz. filet, breaded in our own blend of cornmeal and spices, then deep fried. Served with tartar sauce, French fries or baked potato, salad. Six succulent grilled shrimp with jalapenos, onions and tomatoes. Served with beans, rice, flour tortillas, and an enchilada. Grilled and topped off with onions, tomatoes, jalapenos. Served with borracho beans, rice, guacamole & tortillas. Smaller portions for youngsters, but adults can order, too. One eight-inch flour tortilla filled with Monterey Jack cheese and choice of meat grilled until melted. Served with beans, rice. With bell peppers & grilled onions. Your choice of taco or cheese enchilada, served with beans and rice. Three pieces of tender chicken strips served with French fries and a salad. Three pieces of our tasty tenders served with French fries and a salad. Bohemia, Dos Equis Amber, Corona, Corona Lite, Guinness, Negra Modelo, Tecate, Modelo Especial, Carta Blanca, Dos Equis Lager. Budweiser, Bud Light, Bud Light Lime, Coors, Coors Light, Miller Lite, Michelob Ultra. Coors Light, Bud Light, Miller Lite. Traditional favorite complements any meal. Add a little sangria to your frozen margarita and you have a winning combination. Sweeten up with the fruity taste of strawberry. Sweeten up with the fruity taste of peach or mango. Our regal version made with the finest Sauza Conmemorativo tequila and Grand Marnier liquer. Available by the glass or bottle. To ensure prompt service we do not substitute ingredients on any dish. All dishes are cooked to order using fresh ingredients.